The Navy (Australian, New Zealand and British) played a key role in the Far East and we'd like to show more images and publish more stories on this page that we have dedicated to them. Here is page 3 of our memories of Operations at Sea. We are grateful to Ivor Rich, our staunch supporter in Oz and ex-RN, for sending in the following photographs. 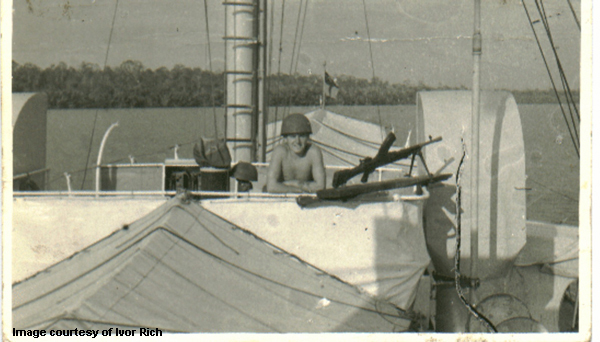 "Me as the rear bren gunner on HMS Alert somewhere near Kuching in 1963." 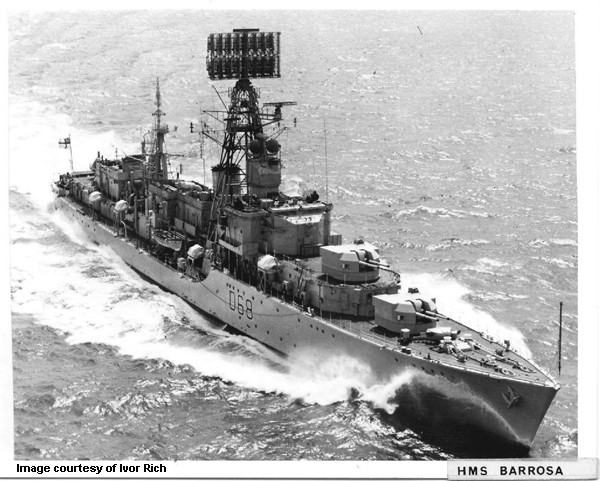 "HMS Barrosa in 1965 in which I did my second stint in the Far East. The Barrosa was fitted with very powerful radar which allowed us to slip into Indodesian waters and spy on their aircraft and ship movements. We also played a role in patrolling around the peninsula." "In February 1963 during operations in the Alice Channel off Sabah, Able Seaman Alan Sutherland from the Barrosa was killed when boarding a suspect boat. Although it was before my time on the Barossa, it made us realise what a fragile environment we served in."